10' - 12' Wide Steel Double Folding Security Gates are for larger openings, overhead doors, dock doors, storefronts, commercial and industrial use. 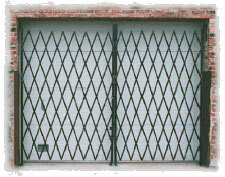 These two-piece gates can be made to any size width, and a maximum height of 10'. Since they are Double Gates, each side will swing (pivot 180 degrees) out of the way. They are made from standard type channel 3/4" (14 gauge), riveted back-to-back with 1-1/2" x 1-1/2" x 1/8" side rails for extra strength. The top bracket (H-Bracket) keeps the gate secure at the top while a center drop-pin provides maximum protection at the bottom of the gate. Gates will lock together at the middle with use of a standard type padlock. See table for specs.